A little late for Halloween, but these Frankenstein Monster Socks are still pretty frightening! I started these socks almost two years ago, when the Stashbuster Spirals Socks were the pattern of the month in the six-sox knitalong. What a great way to use up some leftovers, I thought! Somehow this thought was transformed into the following: What an unattractive way to use up a bunch of wildly mismatched leftovers! So I knit a sock and then thought, "Wow, that's one ugly sock." But I couldn't give up, because I am physically unable to throw out anything that is "still perfectly good," and handknit socks can never be all bad. So I knit most of the second sock before I just couldn't stand it anymore. For the past year or so, these socks have been the proverbial monkey on this knitter's back -- an ugly and obnoxious monkey. I hated to see them almost-finished in the drawer. And this morning, I'd had it. 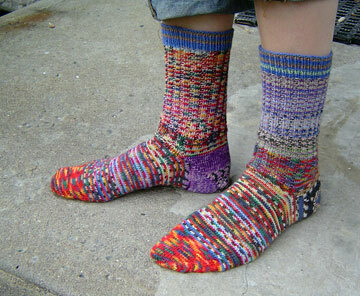 I simply could not go on without finishing these damned socks. So I did. I finished them. 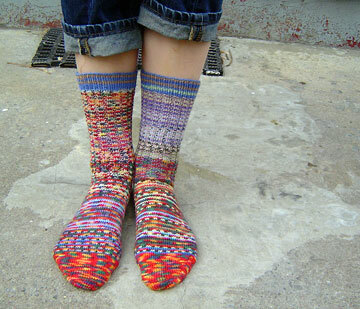 And someday, if all of my other handknit socks are filthy and my feet are cold, I may even wear them.